Starting itself as a Kickstarter project on the 16th of April, 2015 and completing on the 16th of May, 2015 with $69,206(USD) in funding by 1,021 backers. The Piccolino marks itself as being the worlds first compact Arduino with integrated OLED, WIFI, SD Card support and 32K of SRAM. 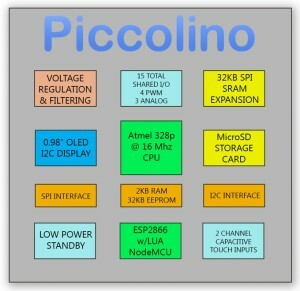 Essentially the Piccolino is a glorified tiny Atmel 328p (16 Mhz) board with an ESP2866 WIFI chip with Lua support, along with a nifty OLED Display. Starting development with the Piccolino is quite easy and can be done with the official Arduino IDE or with other Arduino style IDE’s such as VisualMicro (in Visual Studio), Stino (in Sublime Text 2/3) and embedXcode (in Xcode on OSX). This getting started guide will be based around the official Arduino IDE, but most steps will be similar in other IDE’s. To get started you will need a Piccolino, either on its own or attached to the Carrier Board with an FTDI programmer attached. If you do not have an FTDI programmer, these are generally available at local electronic stores or available on eBay. Once connected, the FTDI driver should install automatically on your respective operating system. Download and install the Arduino IDE and then download the Piccolino Arduino Full Library Pack (v1.2 as of writing) and load this into your Arduino library folder (generally found at C:\Users\<yourusername>\Documents\Arduino\libraries on Windows, and /Users/<yourusername>/Documents/Arduino/libraries on OSX). This will load in a number of example Sketches along with the necessary code to run the majority of the demo’s. Open up the Arduino IDE and click on Examples > Piccolino_OLED > hello_world. This will load up the example Sketch that we can compile and install on the Piccolino. Before doing this however we need to make sure we have the correct board and port selected in the Arduino IDE. Firstly click on Tools > Board and select the Arduino Pro Mini. The should be default select the ATmega328, if it doesnt, change the Processor as well. The click on Tools > Port and select the correct port. In my case this was COM10 on Windows. If you only see COM1, you may need to install some FTDI drivers. Next we can click verify in the Arduino IDE (big tick Icon), and assuming it completes compiling without error, we can click upload (big arrow pointing right). This will run through some commands in the console and you should see avrdude reading in and writing the compiled code into the Piccolino. Once complete you should see some different text sizes on the Piccolino screen that alternates to a number of other displays. If you see all that, you are done!